I love the scrub. It’s one of Lush’ prettier square body scrubs. It has the mimosa flower, Cherry Blossom scent of their popular ‘Sakura’ bath bomb. A feminine scent. The exfoliating is enhanced by the moisturizing Cocoa butter which leaves skin sooo soft afterwards. You just wash in the shower as usual, with soap or shower gel, then rinse off. Then you scrub the rough parts of your body like knees, elbows, legs, etc. Then simply rinse off in the shower and dry yourself off, that’s it. The lovely and natural floral scent lingers on my skin for a couple hours. I would suggest this. 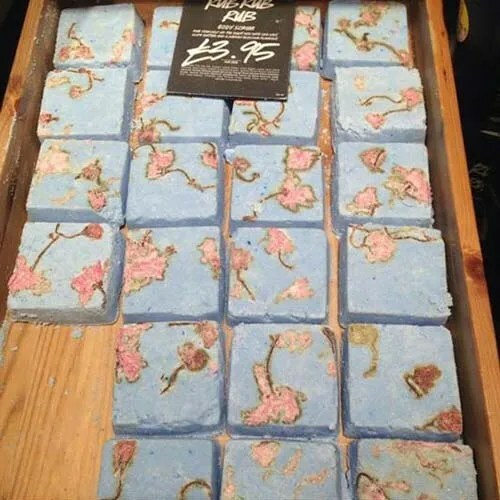 Posted on April 23, 2015 by Lushalot	• This entry was posted in Body Butter Squares, Lush Oxford Street store exclusives, New. Bookmark the permalink.